A child’s first set of teeth are naturally softer and more prone to developing cavities than their permanent (adult) teeth are. While we make every effort to screen for decay early at Children’s Dentistry Group, LLC, sometimes cavities still pop up between routine checkups. When they do, we offer a full menu of pediatric treatments to treat decay and prevent infections from spreading elsewhere in the mouth. Fillings for Children — Primary teeth are less dense than adult teeth are. As such, cavities inside of them can spread very quickly. We take extra care to check for decay on a frequent basis, so that we can treat lesions earlier and before they spread deeper into the tooth. All of our restorative fillings are minimally invasive and made from tooth-colored composite. Pediatric Dental Crowns — Baby teeth aren’t able to support larger fillings as permanent adult teeth can. Once a cavity gets fairly large, the best restorative option is usually a crown. “Why not pull the tooth instead?” you ask. Because premature tooth loss can cause long-term consequences when it comes to the alignment of future adult teeth. Nerve Therapy — Pulp therapy or “pulpotomies” are like the root canal equivalent for treating abscessed or severely decayed baby teeth. Removing the infection prevents it from spreading elsewhere in your child’s face while preserving the tooth. In most cases, we will recommend a temporary crown on the tooth until it falls out naturally when the adult tooth erupts. Space Maintainers and Tooth Guidance — When a tooth is lost prematurely or needs to be extracted before the adult tooth is ready to erupt, it can cause changes in your child’s tooth alignment patterns. To prevent severe orthodontic complications later on, we can use an interim appliance such as a space maintainer to ensure that the adult teeth erupt into place properly. Does your child have a toothache? 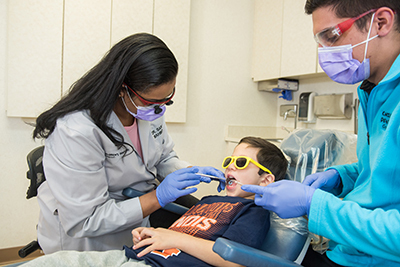 Schedule their exam with our board-certified pediatric dentists and find out how we can help.